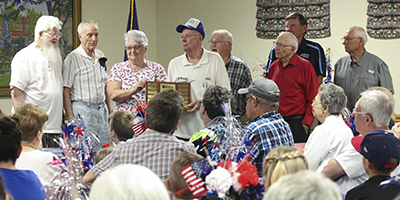 In 2001 the Seward VFW Post 4755 donated a plaque to hold the names of honorees recognized for the annual Seward Fourth of July Service Award for Civic Organizations honoring local civic groups that have given outstanding service to the annual Seward Fourth of July Celebration. The award is given each year at the June Kick-Off Luncheon at the Civic Center at noon the second Tuesday of June. It gives tribute and recognition to groups that have demonstrated the spirit of volunteerism for the previous Seward Fourth of July. The nominations are accepted by the Seward Fourth of July Celebration Committee and the awardees are selected at the April or May Seward Fourth of July Celebration Committee meeting.